St. Martin's Paperbacks, 9781250169006, 304pp. 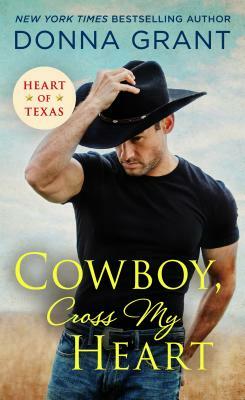 New York Times bestselling author Donna Grant takes you deep inside the Texas rodeo scene in the second book in her Heart of Texas series, Cowboy, Cross My Heart, where danger and desire ride side by side. . .
Brice Harper is all man, all muscle, and all heart. From the moment he rides into the stadium, he can’t help but notice the beautiful stranger with a camera watching him from the stands. It doesn’t take a zoom lens to see the sparks of instant attraction. But things really heat up when he meets Naomi up-close—and he discovers that someone is stalking her friend. Brice wouldn’t be any kind of cowboy if he didn’t offer to help the ladies out. But can the rough rider keep this spirited shutterbug out of danger—without risking his heart?